Authors Rav Zev Shandalov Mrs. Hammer and A Reunion 47 Years in the Making! Forty-Seven years is a long time. It is a lifetime ago in some respects. But a reunion that took place yesterday, made that time seem like yesterday! Mrs. Hammer was back in my life. First a little background. In all the years that I have been writing about various life experiences, I have always shied away from using hyperbole. The reason for this being that usually an event or an experience is not worthy of over-the-top language. However, I did have an experience yesterday that is indeed worthy of a little hyperbole! As many of you who follow me know, I had set out on a mission a couple years ago to find someone who was very special in my life as a child. Most students, but sadly not all, tend to have “that one teacher,” who changes their life. It can be in Elementary school, middle school, college or some other time in a person’s education. For me it was and always will be one special teacher I had in 7th grade: Mrs. Joyce Hammer. Mrs. Hammer taught me a whole lot more than math. She taught me about me. She opened up a world to me that I did not know existed. And, she ingrained in me the self-confidence I needed to succeed as a student. She taught me about growth and how to deal with failure. More, she taught me how to take notes, and how to winnow out the chaff from the wheat. She ingrained in me the feeling that if you really try you might succeed; because in life there are no guarantees. Let’s face it, I was not the greatest student on earth as a kid. Some of my teachers until 7th grade were good and well, let’s say, some were not (I am trying to be kind here!). And then I walked into Mrs. Hammer’s class in September of 1970 (the beginning of the 1970-1971 school year) and my life changed. Sounds like hyperbole? Not at all…because as I have written numerous times in the past about her, she gave me tools to become the teacher I am today. She gave me the insights into how to deal with each child individually. And I wanted to locate her and tell her in person what she meant to me and subsequently to my students…all of them. So, about a year a half ago, I located Mrs. Hammer living in a Chicago suburb and was in touch with her. We corresponded with each other a few times, and I expressed my thoughts and feelings to her. It is not the same when you express yourself in writing vs. expressing yourself face-to-face. And yesterday, I finally had that opportunity! I met her at her home, and I can truly say that the three hours I spent with her were indeed magical! To have an opportunity to thank someone in person, who was so instrumental in your life when you were a child, is a rare gift! We spoke of what she did for me and all that I have written above. I heard stories of where her life and her teaching took her and how she has affected thousands of students over the years. 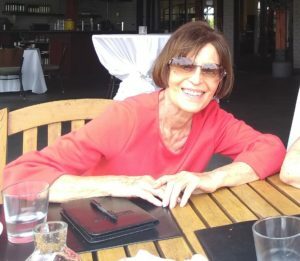 She was and remains highly innovative in her educating of others, in spite of her “officially” retiring many years ago. She gave me some advice about my future path as a teacher; advice that I will indeed take to heart. She still is as beautiful inside and outside today, as she was when I sat in her class at 11 years old. 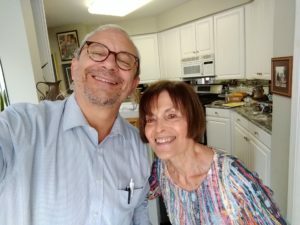 To further understand her dedication to each individual, Mrs Hammer went out to buy a number of kosher products, plastic ware and other items so that I would feel comfortable eating in her home! For her, it was never about the books, the lessons or the material. It was about and is about the person with whom she is sitting. And that is the “thing”. Mrs. Hammer ( I still can’t bring myself to call her Joyce after all these years!) was way ahead of her time. She always took a holistic approach to her students. It is this idea that I have made it my life’s goal to strive for, as well. I do not deal with a text or a test or a paper; I deal with a person, a student. And all of my students have Mrs. Hammer to thank for that! So, Mrs. Hammer, ok, Joyce, thank you from the bottom of my heart on behalf of that 7th grade little boy and on behalf of all of my students. May God shower you with blessings, health and the ability to inspire for many years to come. What a beautiful story! She sees the unique and wonderful child whom God has created and helps that child become whom God would have him/her become. Thank you for following in her path. Being a teacher is a great responsibility and privilege that God allows us. What a joy it is! As an educator, I particularly enjoyed the article. I remember you mentioning her in previous posts.